A thoughtful and age-appropriate introduction to an unimaginable event—the Holocaust. The Holocaust was a genocide on a scale never before seen, with as many as twelve million people killed in Nazi death camps—six million of them Jews. Gail Herman traces the rise of Hitler and the Nazis, whose rabid anti-Semitism led first to humiliating anti-Jewish laws, then to ghettos all over Eastern Europe, and ultimately to the Final Solution. She presents just enough information for an elementary-school audience in a readable, well-researched book that covers one of the most horrible times in history. This entry in the New York Times best-selling series contains eighty carefully chosen illustrations and sixteen pages of black and white photographs suitable for young readers. Switch back and forth between reading the Kindle book and listening to the Audible narration. Add narration for a reduced price of $6.49 after you buy the Kindle book. A thoughtful and age-appropriate introduction to an unimaginable event-the Holocaust. Was Anne Frank book. It came on the release date (thanks Amazon) and she was stoked. She loved the book. She gave it to a neighbor tho read next. 5.0 out of 5 starsHolocaust. I liked the whole story. I think it’s too short but it’s a good beginning to learn about this important issue in the human history. I recommend this book to young people who are starting this kind of readings. I gave 5 stars because it was a very good book to read fast. This series of the book is a good one for kids to get a little about different aspects of human life. "In 1935, other groups were imprisoned, including gay people" p.33, chapter IV. This is a slap in the face to the whole Jewish world and cannot be in the book about holocaust during WW2. The question to Author. How dare are you adding propaganda into historical book about holocaust? How many Jewish were imprisoned and killed? How many gays were killed? Do you realize the difference? What did you want to say highlighting just gays? "In 1935, other groups were imprisoned, including Christians and people of different races"
This is a good way to introduce the Holocaust to middle school children. From that you can move into appropriate avenues of knowledge. 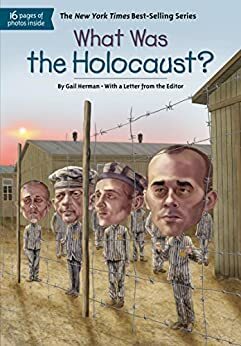 My almost 8 year old asked me for a book on the Holocaust and I ordered him this one. I skimmed through it and was satisfied to see that there wasn't anything inappropriate or gory. He read it quickly. It gives a good basic overview or what led up to the war, the Holocaust, and the aftermath, and it includes a nice amount of pictures.